A 41-year-old male with 20-pack-year smoking history presented to the ED with 3 weeks of worsening shortness of breath, dysphagia, and coughing, and sudden onset of throat pain after eating and vomiting. On examination, he appeared in distress, with a muffled/hoarse voice and posterior pharyngeal erythema. Initially his symptoms were attributed to a food bolus, but he was unable to tolerate water or his secretions. Otolaryngology was consulted, and the patient was given dexamethasone and racemic epinephrine. 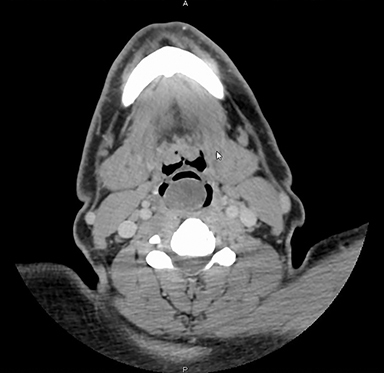 A contrast-enhanced CT of the soft tissue of the neck revealed a well-defined, oblong soft tissue 1.7 × 2.7 × 3.9 cm mass arising from the right aryepiglottic region and narrowing the hypopharynx, (Figures 1-3). The patient underwent an awake tracheostomy placement and direct laryngoscopy with biopsy. 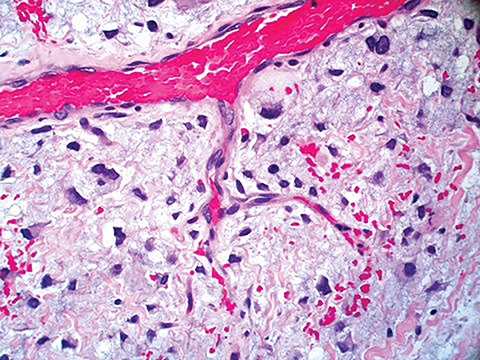 Initial pathology was low-grade sarcoma or myxosarcoma. Immunohistochemical (IHC) stains on paraffin sections were reactive to vimentin, focally reactive to desmin, but negative for S100, indicating the mass was mesenchymal and connective tissue in origin, most consistent with a sarcoma. Given the rarity of sarcoma in this location, the patient underwent excisional biopsy of the mass. Axial CT image (Figure 1) shows a low-attenuation soft tissue mass posterior to the epiglottis that significantly narrows the airway. 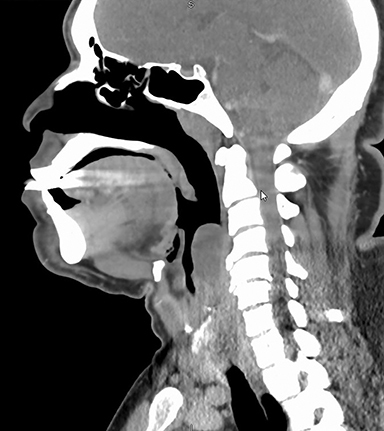 Sagittal CT (Figure 2) image shows a low-attenuation mass anterior to the cervical vertebrae, causing significant narrowing of the airway. Figure 3 shows a high power (400x) view showing lipoblasts, pleomorphic lipoblasts, and mature adipocytes. Dedifferentiated liposarcoma arising in the background of well-differentiated liposarcoma, with MDM2 gene amplification detected on fluorescent in-situ hybridization (FISH) testing. Liposarcoma subtype is based on histologic and genetic findings, although computed tomography (CT) and magnetic resonance imaging (MRI) are important for characterizing and determining tumor extent. The size of the tumor is important to note, as masses greater than 5 centimeters upstage the tumor. Certain CT/MRI features may support a specific grade and/or subtype. >As evidenced by the literature and our case, when presented with a soft-tissue mass in the head/neck, it is important to consider liposarcoma, although it is rare. Imaging with MRI and/or CT is important in localizing the mass and determining its size and potential involvement of adjacent neurovascular structures prior to resection. Subtle findings in these modalities can even help to differentiate between subtypes of liposarcoma; however, pathology is required for a final diagnosis. Surgery continues to be a mainstay of treatment. Newer adjuvant therapies are being investigated, which is important, as complete resection of cancer in this area can be difficult when trying to preserve satisfactory postoperative function. Gaillard F, and Di Muzio B. “Liposarcoma | Radiology Reference Article.” Radiopaedia.org. Radiopaedia, 2017. 10 Mar. 2017. Munk, PL, Lee MJ, Janzen DL, et al. “Lipoma and Liposarcoma: Evaluation Using CT and MR Imaging.” American Journal of Roentgenology 169.2 1997; 589-594. Yueh B, Bassewitz HL, and Eisele DW. “Retropharyngeal Liposarcoma.” American Journal of Otolaryngology. 1995; 16(5): 331-340. Nouri H, Hassani R, Aderdour L, and Raji A. “The Well-differentiated Liposarcoma of the Hypopharynx.” European Annals of Otorhinolaryngology, Head and Neck Diseases. 2011;128(3): 143-145. Zhu H, Sun J, Wei S, et al. “Well-Differentiated Laryngeal/Hypopharyngeal Liposarcoma in the MDM2 Era Report of Three Cases and Literature Review.” Head and Neck Pathology (2016): n. pag. SpringerLink. Riva G, Sensini M, Corvino, Garzaro AM, and Pecorari G. “Liposarcoma of Hypopharynx and Esophagus: A Unique Entity?” Journal of Gastrointestinal Cancer 47.2 (2016): 135-42. Doyle, Leona A. “Sarcoma Classification: An Update Based on the 2013 World Health Organization Classification of Tumors of Soft Tissue and Bone.” Cancer 120.12 (2014): 1763-774. Kikuchi, N., T. Nakashima, J. Fukushima, K. Nariyama, and S. Komune. “Well-differentiated Liposarcoma Arising in the Parapharyngeal Space: A Case Report and Review of the Literature.” The Journal of Laryngology & Otology 129.S2, S86-S90.3 (2015). Vella, O., A. Bequignon, F. Comoz, and E. Babin. “Retropharyngeal Liposarcoma: A Rare Cause of Dysphagia.” European Annals of Otorhinolaryngology, Head and Neck Diseases 133.6 (2016): 429-430. Kransdorf, M. J., J. M. Meis, and J. S. Jelinek. “Dedifferentiated Liposarcoma of the Extremities: Imaging Findings in Four Patients.” American Journal of Roentgenology 161.1 (1993): 127-130. Mcculloch, T. M., K. H. Makielski, and M. A. Mcnutt. “Head and Neck Liposarcoma: A Histopathologic Reevaluation of Reported Cases.” Archives of Otolaryngology - Head and Neck Surgery 118.10 (1992): 1045-1049. Eeles, R. A. et al. “Head and Neck Sarcomas: Prognostic Factors and Implications for Treatment.” British Journal of Cancer 68.1 (1993): 201–207. Nassif NA, Tseng W, Borges C et al. Recent advances in the management of liposarcoma. F1000Research 2016, 5(F1000 Faculty Rev):2907. Tirumani, S.h., H. Tirumani, J.p. Jagannathan, A.b. Shinagare, J.l. Hornick, N.h. Ramaiya, and A.j. Wagner. “Metastasis in Dedifferentiated Liposarcoma: Predictors and Outcome in 148 Patients.” European Journal of Surgical Oncology (EJSO) 41.7 (2015): 899-904. Golledge, Jonathan, Cyril Fisher, and Peter H. Rhys-Evans. “Head and Neck Liposarcoma.” Cancer 76.6 (1995): 1051-1058. Gerry, Daniel, Nyssa F. Fox, Laura S. Spruill, and Eric J. Lentsch. “Liposarcoma of the Head and Neck: Analysis of 318 Cases with Comparison to Non-head and Neck Sites.” Head & Neck 36.3 (2013): 393-400. Kumar K, Kurian S, Chin B. Dedifferentiated liposarcoma of the hypolarynx. Appl Radiol. 2018;47(9):44-46. Prepared by Ms. Kumar, Dr. Kurian, and Dr. Chin while at the Department of Radiology, St. Luke’s Hospital, University of Missouri- Kansas City School of Medicine, Kansas City, MO.